We were all born with a disease. A disease that in the end will kill us all. No one on this earth can escape. We inherit it from our parents. It has been past down from generation to generation since the beginning of time. The name of the disease is sin. God created angels, which is a spirit race of individuals that have thought, a free will and emotions similar to us. One day a very high ranking angel who sat on the left hand side of God decided, through his own vanity, that he would ascend to heaven and raise his throne above the stars of God. He would make himself like the most high. He convinced one third of the angels to follow him. He lead a great revolt and there was war in heaven. God crushed this revolt and put the followers of Lucifer – Satan in chains in total darkness in a place called Tartarus. The design of this world was in Gods mind before He ever created the first speck of dirt. God created the physical universe in response to what happen in eternity prior to our creation. Our physical universe is controlled by time and space, however eternity is a place where there isn’t time – hours, days, weeks, months and years, and there isn’t any space or dimension – height, width or depth. Eternity is what God is. Satan is what God made him and Christians today spend far to much time worrying themselves over an adversary who was defeated by the crucifixion, burial and resurrection of Jesus Christ. Who once and for all defeated death and the grave. The only power that Satan has over us is what we give him through our disobedience to God. When we believe in Satan’s lies it prevents us from having faith in God and His Christ and disobedience is what the Bible calls sin. 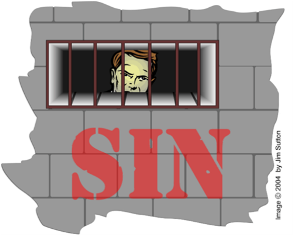 The main reason for disobedience or sin is unbelief.